This multi-level home is in development for a family currently living in a traditional home but wanting a space that caters to their more modern aesthetic. 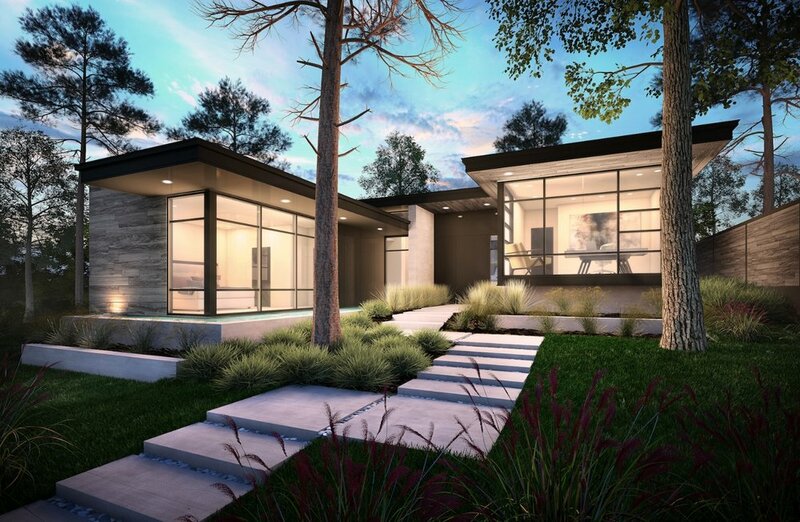 Mindful Modern Living℠ in Dallas, Texas. Dallas, Texas + 4,000 sq. ft. This multi-level home in Dallas is in development for a family currently living in a traditional home but wanting a space that caters to their more modern aesthetic. As their children mature, they want a home that reflects their current lifestyle: active, functional and spiritual. The design allows them dedicated space for reflection, open space for entertaining, and a resort-like backyard that accommodates their immediate and long-term needs. Q: Rene, what was the inspiration for this particular design? A: The site itself was what we used as the inspiration. Before we started the design process, we spent an entire afternoon on the site. It's a very wooded lot with mature trees and we wanted to make sure the design took advantage of this. As we started thinking about how the house could be laid out, we wanted to make sure the trees were a part of the design and added character to what this home would become. We were also attracted to the different level variations and how they related to the space. Q: And speaking of the levels, how did the topography play a part of the design? A: Well, the topography was a large part of it. We liked the idea of using the different levels to create curiosity within the design. Since the lot wasn't flat, we could take advantage of this. For example, when you're standing at the front door, you can see through to the back yard but since you're not on the same level as the backyard, you only get a glimpse. Q: What makes this design different from previous projects? A: The lot's elevated approach is very unique because it allows light to filter through various areas as the home stair-steps across the site. The levels allow glimpses of the tree tops as you walk throughout various aspects of the home. Q: You're known for your use of natural elements when designing. What materials are being used for this project? A: We believe in keeping the integrity of the space in tact when building new construction – everything from the trees to the natural elements. Solid concrete walls are used to create anchors to the home. The front rooms are also unique because one is surrounded by a reflective pool while the other floats over the ground below. Q: What's your favorite design detail for this project? A: The connection between water and space. Water is visible throughout the entire site and among the various levels – from the back of the lot to the front tip of the home, water is a constant element. Q: How does this design elevate the concept of Mindful Modern Living℠? A: Family and spirituality is extremely important to this client, so a space for reflection was instrumental in the final design. The floating room is a place of solitude that takes advantage of the surrounding trees and movement of water from the adjacent reflective pool. In the early morning or late evening, the water will reflect light and create a very tranquil, calming space.